In a petition to the court, 'Women of the Wall' ask permission to bring a Torah scroll into the plaza with them every Monday and Thursday. After filling a petition to the Supreme Court, the Women of the Wall are asking for a response document to allow them to bring a Torah scroll to the traditional prayer section of the Kotel plaza on Mondays and Thursdays and not only on Rosh Hodesh, in a "temporary" arrangement. The petition was filed after the government submitted a request to postpone the hearing in 90 days to formulate its position. In the petition, the women exclaim that they oppose the postponement and require a temporary arrangement. They argue that the governmental decision does not respond to their needs, because they want to pray at the traditional Kotel plaza Wall but with Torah scrolls, in defiance of traditional practices. 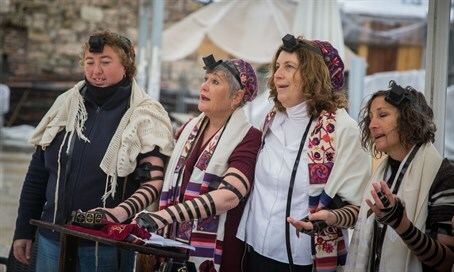 "The (current) arrangement does not protect the rights of petitioners and the rights of other women seeking to pray at the Western Wall, with women, with a Torah scroll," the petition stated. The group held a Rosh Hodesh prayer session at the Western Wall (Kotel) last Friday and once again smuggled a Torah scroll into the women's section of the Kotel Plaza in breach of their agreements with Attorney General Avichai Mandelblit. During negotiations for outlining the distribution of Kotel sections - including a new sections exclusively for non-Orthodox prayer such as that advocated for by WoW - it was agreed between the women and Mandelblit.that they will stop smuggling Torah scrolls and generating provocations at the Kotel. Kotel Chief Rabbi Shmuel Rabinowitz said that the fact that WoW activists were still campaigning at the Orthodox section of the Kotel despite having received their own section "once again testifies that the goal is only provocation and defiance, strife and quarrel and a desecration of the holy, and no gesture or appeasement proposed to them will help against this intention." "In pain I view before me this small group that set as its goal to disrupt the gentle fabric that exists at the Western Wall Plaza, and to turn the Western Wall Plaza into lands of strife," added the rabbi.